This is a guest post by Braedan Dunne. Thanks, Braedan! 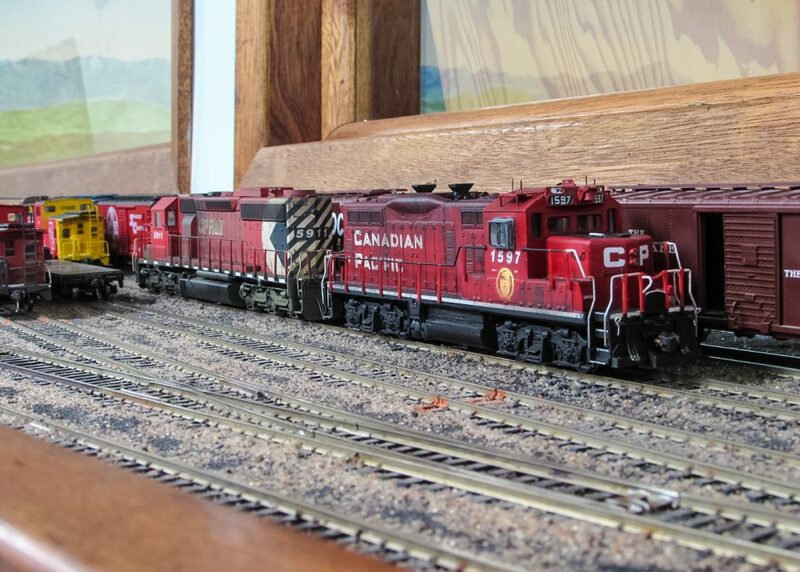 After looking for prototype images a few months ago, I came across a photo at traingeek.ca featuring CP GP9u 1597, which I have in HO scale converted from a Walthers Trainline GP9m. However, what was connected to CP 1597 in that photo made me all the more interested. 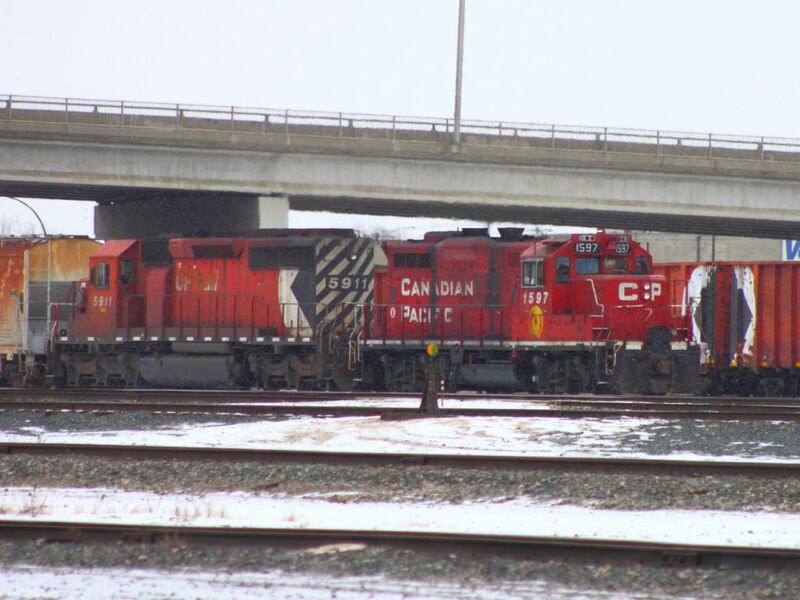 It was CP SD40-2 5911, which is one of only two locomotives still on CP’s roster that remains in the ‘Large Multimark’ paint scheme. 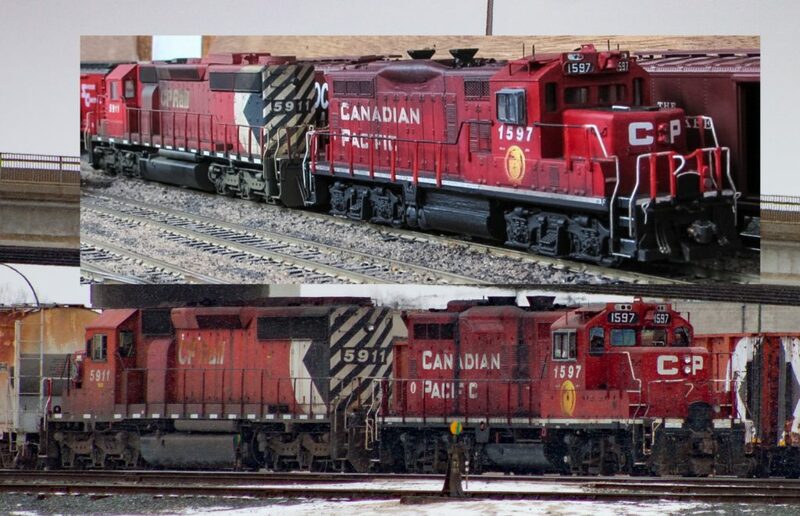 I was lucky that a good friend of mine from Medicine Hat, AB, who is currently a CP conductor, had his new Bowser HO CP SD40-2s renumbered and/or weathered by a couple of talented modellers in northern Alberta. During our last club meet at the Southern Alberta Model Railway Club of Lethbridge, my buddy made it down to run his completed SD40-2s. One of those models was CP 5911. With the opportunity there, I took my GP9u and connected it to the SD40-2 in the main yard of the club layout and shot a recreated scene of the photo I first saw. Thanks Braedan for the post and the images! You’ve done an excellent job updating the Walthers Trainline model to accurately reflect the prototype… and that Bowser SD40-2, upgraded and weathered, looks great too. I’ve stuck the two photos together for comparison below. The models look fantastic!